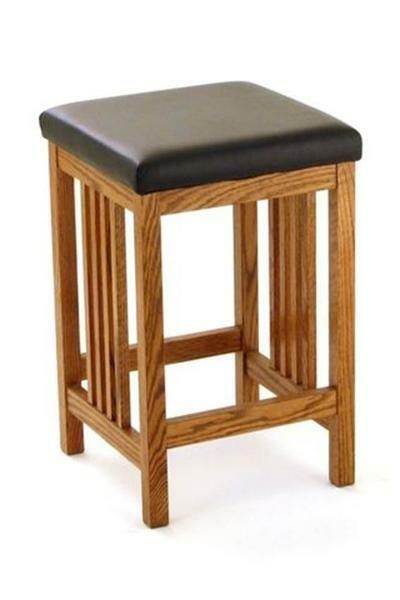 Have a seat and relax with our Amish California Mission Backless Barstool. This Mission Barstool has a sturdy, solid wood, authentic Mission styling plus it's handmade in the USA by an Old Order Amish Craftsman! Choose the seat height to fit your counters as well as the wood, finish, and seat option. We are happy to send out wood and finish samples to help you match up to your existing furniture. We love the look of a dark, handsome leather upholstered seat on this Mission barstool. Create a comfortable spot for guests and family alike to relax with ease. Use your new barstool wherever it is needed, from the kitchen to the family room. The possibilities are plenty for our Amish California Mission Backless Barstool. Please reach out should you have any questions about our Amish furniture. A friendly specialist would love to speak with you at 866-272-6773. You also can stop by our Amish furniture store in Sarasota, Florida to see our furniture in person. I would recommend DutchCrafters to others. Quality was excellent.